Researchers have tested a unique combination of hybrid supercapacitor-battery materials that combines fast electrochemical charge times with the high energy density of a li-ion battery. Li-ion batteries with high specific energy, high power density, long cycle life and low cost are critical for widespread adoption of electric vehicles. A key bottleneck in achieving this goal is the limited fast charging ability of Li-ion Batteries. Rapid charging causes accelerated degradation of the battery as well as a potential fire hazard due to local over-potential build-up and increased heat generation. Li-ion Batteries have the highest energy density but typically suffer from low power density. On the other extreme, electrochemical double-layer supercapacitors, which store energy through accumulation of ions on the electrode surface, have low energy storage capacity but very high power density. A special category of electrochemical capacitors is provided by redox capacitors. Here, charge is stored through surface or bulk (pseudocapacitive) redox reactions, similar to Li-ion Batteries, yet, with a very fast charge transfer response, similar to electrochemical double-layer capacitors. Although excellent capacity retention for extended cycling can be obtained even at high charge - discharge rates, specific capacity of redox capacitors is typically lower than for Li-ion batteries. The most intuitive approach to combine high energy and high power density within a single device is to combine the different types of energy storage sources. So far, mainly hybridization between electrochemical double-layer capacitors and Li-ion batteries has been explored. The primary drawback of this approach is that power and energy performances are decoupled. At high current densities, the response is dominated by the electrochemical double-layer capacitor component, considerably diminishing the energy density of the hybrid device. Researchers have now shown that enhanced battery-capacitor hybrids can be constructed by careful choice of the super-capacitor and battery components. They combined a lithium iron phosphate (LiFePO4) battery material with poly (PTMA) redox capacitor. The PTMA and LiFePO4 hybrid ultra-battery gives best-of-both-worlds performance characteristics: high energy and power capacity as well as fast and stable recharge for more than 1,500 cycles. In addition to improved cycling and rate performances, the hybrid electrode features a unique fast charge storage mechanism. 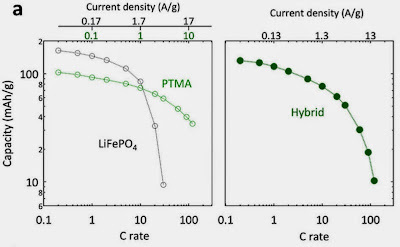 When a charge current is applied on the hybrid electrode, the polarization of PTMA and LiFePO4 overlap above the equilibrium values and both components are charged (or, oxidized). However, the faster redox kinetics of PTMA results in excess charging of the PTMA component. When the current supply is stopped, the potential of both components in the electrode tends to reach their equilibrium open circuit potential. 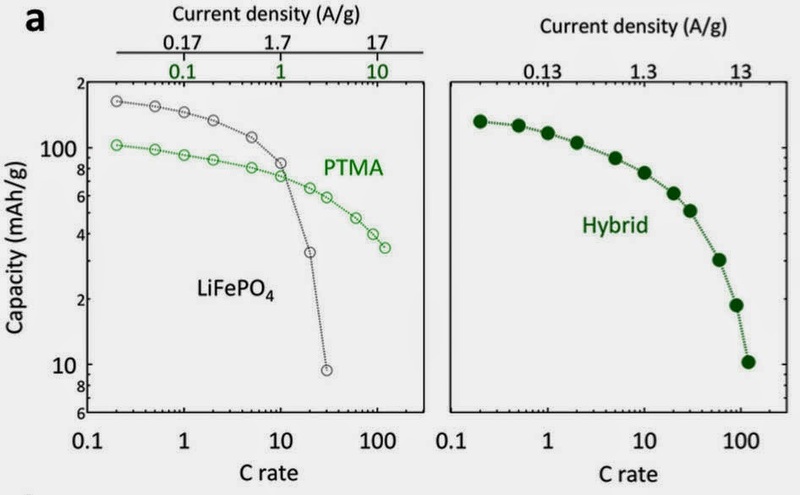 However, the electrochemical potential of the PTMA is higher than that of LiFePO4. According to the first law of thermodynamics the overall state-of-charge (SOC) of the electrode will remain unchanged, mainly the PTMA/LiFePO4 charged species ratio will change. The hybridization of the two separate components yields a remarkable set of properties. The appropriate redox couples, flat-potential profile and elevated specific capacity yet, different redox kinetics for PTMA and LiFePO4, offer a hybrid battery electrode where the fast electrochemical response of PTMA delays the voltage rise during the charge process. This implies significant improvements for the rate performance, cycle lifetime and safety of lithium-ion batteries during rapid recharge. This novel approach paves the way to new design rules for Li-ion battery electrodes and may prove pivotal in pushing the performance envelope of Li-ion batteries towards the goal of increasing adoption of electric vehicles.